*sigh* Another Youth Trip event I won’t be joining. It’s not meant to be, Clare! Take this unique break and enrich your taste by learning more about our coffee and culture. 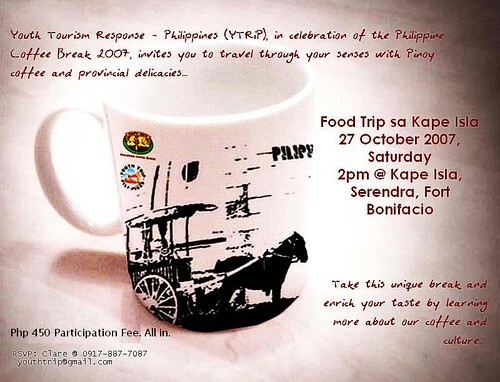 An afternoon of Pinoy coffee and provincial delicacies with a Coffee 101 lecture; Php 450 participation fee. E-mail your inquiries and reservations to youthtrip [at] gmail [dot] com.